Some of us approach evangelism with about as much enthusiasm as our sixth-grade spelling bee. Joy would certainly not be the first word that comes to mind when we think of such a task. Instead, fear—the fear of man and of messing up—can dominate our thoughts and stifle any inclination to open our mouths. But speaking the gospel doesn’t have to be so dreadful. 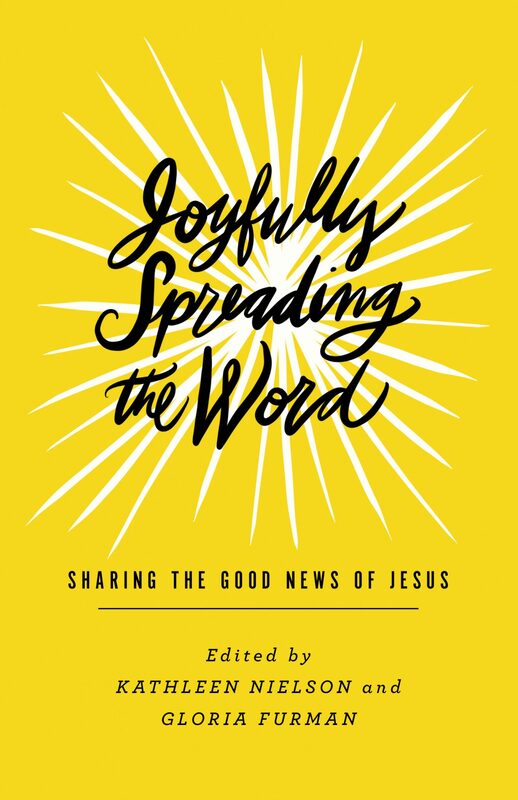 In their new book, Joyfully Spreading the Word: Sharing the Good News of Jesus, editors Kathleen Nielson and Gloria Furman bring together a cadre of authors (Becky Pippert, Megan Hill, Camille Hallstrom, Eowyn Stoddard, Jamie Love, SharDavia Walker, Happy Khambule, and Rosaria Butterfield) to give an inspiring picture of everyday evangelism “by women and mainly for women.” But it’s a picture that encourages us all—not just women—through helpful examples of joy-filled gospel proclamation. In Joyfully Spreading the Word, we encounter stories from all over the world—immigrants and medical professionals, seasoned missionaries and stay-at-home evangelists, college professors and campus ministers. From their experiences we get a taste of how they approach gospel conversations with co-workers, friends, strangers, and even the little ones sitting at the breakfast table. Perhaps the greatest strength of this collection is the way it disciples us by showing us what it can look like to spread the good news. At the heart of discipleship is learning by example. We need others to teach us the what of evangelism, but also to show us how it’s done. We need others to teach us the what of evangelism, but also to show us how it’s done. Many of the book’s stories culminate in others coming to Christ by faith. Some don’t, and realistically so. But all give a clearer picture of what it looks like to love our neighbor as ourselves and evangelize those around us. While summarizing the benefit of each story would require a full retelling—or you reading the book!—a couple distinctive contributions should be mentioned. Crossway (2018). 192 pp. $16.99. You can be a part of the spread of the gospel in the world. Here are theological reflections and real stories from women from across the world who are eagerly sharing the good news of Jesus wherever God has placed them—showing us just how possible it is to follow Jesus’s call to evangelism in our ordinary, everyday lives. For one, throughout Joyfully Spreading the Word there’s a clear demonstration of leading with the gospel. These women don’t merely wait for relational capital before explaining their faith. Instead, they courageously share their faith with nonbelievers, doing it early and often. Not in a bludgeoning or self-righteous way, but at the outset of a relationship or even a first encounter they look for ways to make it known they’re a Christian (128). They don’t just stall and pray for “gospel opportunities.” They make those opportunities happen (humanly speaking) by steering conversations toward spiritual matters. Along those lines, the book offers plenty of helpful conversation starters. They’re not presented in formulaic fashion, but together the stories combine to offer creative ways of pursuing the gospel in everyday life. Some of the authors prefer to ask direct questions, such as “What will you do with your sin?” (84). Some offer to pray for hurting people. They welcome sinners into their homes, and they seek them out on the street, finding the courage to open their mouths to a stranger with a simple and smiling “Hello” (90). Another strength of this book (not easily achieved in an edited work) is the balance represented throughout the various contributions. First, in a book on evangelism, it’s encouraging to see an emphasis on both the attitudes and also the actions of an evangelist. The words we speak flow “out of the abundance of the heart” (40). Evangelism, then, is to be a spontaneous and unstoppable geyser of God’s love within us. This loving act requires a combination of faith and wisdom: faith in the God who works in us; wisdom to see that work taking place in people around us (80). The book also upholds the dual operation of Word and Spirit. Various chapters emphasize prayer as critical to our evangelistic efforts (42). They also remind us of God’s ordained plans in sending us out with a message. Having an appreciation for that “sent-ness” and God’s providential placement of us, his ambassadors, allows us to view the mundane and even unwelcome circumstances of life (something like a call from the school office) as an opportunity for witness (87). In all of this, the ministry of the Word takes precedence, for it is the appointed means of the Spirit to save sinners (113). As such, story after story in the book demonstrates the power of “getting people in the Word and letting God speak to them” (130). Evangelism is to be a spontaneous and unstoppable geyser of God’s love within us. Last, the book intentionally addresses the controversial and at times off-kilter approach to mercy ministry alongside proclamation ministry. Here too Nielson and Furman strike a helpful balance, introducing no competition between the Great Commandment and the Great Commission, but showing that the God who reveals himself through word and deed calls us to do the same. This reality is also demonstrated by the one Spirit who empowers the church with gifts of service and speaking, all to accomplish the mission (67). While the intended audience for this project is primarily women who want to learn and grow in communicating the good news, there’s much wisdom (and inspiration) for all in this book. As a man assigned to review such a work, I can heartily recommend it to a wide audience. In fact, I found no substantial concerns, just the occasional skip-a-beat syndrome common to most edited books, where chapter to chapter the style or topic may change with some amount of syncopation. But overall, those differences in author and story, even their varied approaches, are mostly harmonic. Each member demonstrates her own gifting for serving others and speaking the gospel, according to the Spirit’s design. The result is a beautiful chorus exhibiting the glory of spreading the good news and seeing others find life in Christ. Prayerfully, the Spirit will also use their words to overcome more of our own fears—complete with sweaty palms and racing hearts—to loosen our lips with joyous good news.